This research examines the assumed relationship between Western education and democracy as it relates to Middle East leadership. While previous literature on this topic has argued that a non-Western leader's Western education is a positive contributor to democratization within that country, salient examples in the Middle East seem to contradict this trend. Among these are Bashar al-Assad, Hosni Mubarak, and Zine El Abidine Ben Ali – while these three individuals are recipients of Western degrees, the prospects of democracy in their countries are notoriously low. The purpose of this research is to study this linkage and its implications for democratization efforts in the Arab World. First, a large-N study is used to see the overall impact in this region of Western education of a leader with its Economist Intelligence Unit democracy index. Then, to delve deeper into the issue, two cases will be examined: that of Gaddafi, the Libyan president who was not Western-educated and was highly nationalist, and his Tunisian counterpart Ben Ali, who was Western-educated and whose country is often regarded as the sole success story of the Arab Spring. The discourse and policies of these leaders are compared, and implications are drawn. Democracy is a concept generally associated with the West, particularly the United States and Western Europe. However, since the end of the Cold War, there have been many efforts to spread this system of government throughout the developing world. This process has taken the form of foreign aid, as in the US' Truman Doctrine, economic integration, as with the EU and Eastern Europe, and soft-power diplomacy, as well as military intervention. These methods have had varying degrees of success, but an often overlooked way of introducing democracy to the non-West is through the exposure of nonWestern leaders to Western education systems. There are many current and past leaders of non-Western countries who have attended universities and secondary schools in the US and Europe, a trend which has accompanied a wave of democratization in Africa, Asia, and Eastern Europe in the last twenty years. Many scholars have theorized that these trends are connected, asserting that a Western education is the reason behind a non-Western ruler's democratization initiatives; this theory has generally been supported by statistical studies. However, the 2011 Arab Spring uprisings drew the world's attention to the Middle East as a hotbed of political oppression and protest. Despite the fact that many Arab leaders, such as Bashar al-Assad, Zine El Abidine Ben Ali, as well as post-Arab Spring rulers, such as Mohammed Morsi, were educated in the United States or Europe, it appeared that a Western education did not have the desired effect on democratization within these countries. This paper aims both to test the existing theory that Western-educated leaders are more likely to democratize as well as to uncover the dynamics of this relationship within the Middle East. It will be determined whether the Middle East is an exception to this theory and, if so, what factors play into this discrepancy. The issue of Western-educated dictators in the Arab World is ambivalent: on one hand, cases of benevolent leaders such as Ben Ali and Sheikh Hamad indicate that a Western education is the key to domestic stability; on the other hand, however, the examples of Bashar al-Assad, Mohammed Morsi, and Hosni Mubarak suggest that a Western education is insufficient to ensure democracy. In order to understand the effects of Arab rulers' education on their policies toward democratization, several other relationships must be examined: the power of individual leaders to control political developments and institutions, the influence of a ruler's education on his or her leadership philosophy, and the connection between Western thought and democracy. These relationships give insight into the effects of a leader's education on his or her democratization practices. This is not necessarily a direct relationship, as existing institutions and attitudes may be hostile to democratization and may hinder a leader's ability to affect positive democratic change. A deeper look into the debates surrounding this topic reveals that a Western-educated leader is more likely to democratize, but this process can be distorted by institutional factors. Many arguments surround the question of individual leaders' policymaking power, also known as the levels of analysis question. These arguments can be grouped into those that argue that a leader can be instrumental in affecting regime change, and those that cite institutions and external actors as greater determinants of governmental structure, as well as those opinions that fall in the middle. A moderate interpretation of this question is the most appropriate, because although these Arab rulers have sovereignty within their nations, they are often bound to other interests and institutions which may limit their political goals. A central goal of this research is to determine the degree to which these limitations affect Western-educated leaders' political power. Some literature places a heavy importance on the role of the head of state in pursuing political objectives. However, much of this discourse neglects the role of authoritarian rulers in democratization. Jennifer Gandhi and Adam Przeworski describe the ability of authoritarian rulers to manipulate institutions to achieve their political goals (2007). While most of the cases they examine describe rulers whose goals centered on maintaining power, this article also demonstrates the ability of rulers to establish democratic institutions and gain widespread support within their countries. If rulers are able to effectively manage political coalitions and gain a following, democratization is a realizable process. Torun Dewan examines the role of a leader's rhetoric in shaping political events (2012). Her examination of the impact of rulers' rhetoric on policy outcomes suggests that individual agency in leadership is an instrumental factor in policymaking and also indicates the importance of examining rhetorical decisions. Rhetoric can be shaped by, and reinforce, Western ideologies, as in the case of Gaddafi's anti-Western inflammatory rhetoric or Ben Ali's moderate stance. Laurence Louër describes the efforts of the ruling Al-Khalifa and Al-Sabah families in Bahrain and Kuwait to institute democratic reform (2005). This example illustrates the ability of monarchic rulers to institute democratic initiatives. However, polls and surveys overwhelmingly suggest that in these countries, institutions and the public were very amenable to such reforms. A weakness of these arguments is that they do not assess institutional or societal obstacles to democratization that may be present in Arab Spring countries. Eva Bellin presents the viewpoint that institutions and political groups are more important in shaping national policy than rulers' decisions (2004). Bellin explains that domestic institutions and society in the Arab World are far more amenable to authoritarianism than democracy, and for that reason prospects for democracy are limited. Other scholars, such as Davorka Matic and Mirko Bilandzic, argue that Islamist movements and other special interest groups will largely determine political developments in the Arab World (2010). While it is true that democratization prospects are often hampered by inefficient government and corrupt institutions, Bellin does not seem to take into account the fact that, overwhelmingly, polls collected from Arab Spring countries indicate popular support for democracy in the Middle East. If Arab countries are hostile to democracy, as Bellin argues, that does not explain its popularity. However, an important point that Bellin raises is the role of Islam in government and society. Religion might be an impeding factor to rulers' imposition of their Western education into their political programs, as institutionalization of Islam in society is often counterproductive to democratization. In order to examine democratization prospects in the Arab World, a more nuanced understanding of individual agency in leadership is needed. Robert Jervis argues that ambivalence is necessary in determining this variable, as differences in public attitudes and institutional demands may vary over time (2013). However, his scope is constrained to US presidents, leaving out the possibility of inter-country differences. Additional factors, such as economic climate, can affect the efficacy of a ruler's initiatives (Byong Kuen Jhee, 2008). This effect on Arab rulers' political goals is unclear, and an objective of this research. Given that Arab dictators are able to affect some degree of political change with regard to democratization, the next question is whether a leader's education will contribute to his or her political philosophy. On this issue, literature is split between the realist view that rulers will pursue their selfinterest regardless of the ideological justifications, and the constructivist view that education and ideology will factor into a leader's decision making. Most literature on this subject revolves around the argument that a ruler's political agenda is determined simply by cost-benefit analysis and strategic action. Bruce Bueno de Mesquita describes the ambition of a ruler in affecting regime change as a function of the size of the winning coalition and voting base (2002). This view purports that leaders will consistently strive to maintain their own power, often at the expense of the general public. This realist argument neglects the influence of education and external influence altogether. Agnes Cornell claims that leaders will take action based on the perceived threat of losing power, demonstrating that, even in the presence of foreign aid as an incentive to democratize, a regime leader will often democratize only insofar as he believes that he will be able to retain power (2012). This claim may prove to be a caveat for the case of Arab Spring rulers, whose education and experiences are conducive to democratization, but who pursue authoritarian ruling styles out of fear of losing power. Conversely, Gandhi and Przeworski assert that leaders' pursuit of policy concessions or fostering of political institutions is simply a guise for maintaining influence and forestalling a rebellion (2007). While these arguments provide insight into possible reasons behind authoritarian rulers' actions, they neglect the issue of a ruler's leadership ethic favoring democracy. The opposing view to this realist perspective on ruling takes into account individual rulers' personal histories when analyzing their discourse on democracy and Westernization. Thomas Gift and Michael Krcmaric evaluate quantitatively the positive correlation between Western-educated leaders and democratic rankings in non-Western countries (2013). This research establishes a theory that can be tested by examining its applicability in the Arab World, where outliers such as Bashar al-Assad and Hosni Mubarak indicate a need for further attention to the region. Daniel Byman draws a link between Gamal Mubarak's Western education and his early rhetoric praising liberal economic policies, as well as supporting human rights initiatives (2010). He also uses the example of Sief Al-Islam, Gaddafi's son, to claim that a Western education positively impacts an individual's view of democracy. While he acknowledges external factors such as military influence and bureaucratic control of the government as hindrances to democratization, he draws the link between education and a philosophy of democratization. This argument effectively addresses the individual as well as institutional and national levels of analysis. What remains to be seen is the translation of this personal philosophy into democratic reform. While it has been established that government leaders in the Arab World have a degree of sovereignty within their regimes, and that their political outlooks can be shaped by their education, the link must be established between Western thought and democracy. Assuming that a Western university would espouse "Western" political and ideological traditions, it is generally agreed upon that Western thought is amenable to democracy. Classical Western thinkers such as John Locke, Jacques Rousseau, and Baron de Montesquieu establish the ideals of separation of powers, a social contract, and privatization of property (Locke 2002; Rousseau 1913; Montesquieu 1777). The works of these scholars are taught at most Western colleges and universities. Additionally, the United States in particular presents itself as a forbearer of democracy, as can be seen in its policies during the World Wars, the Cold War, and the War on Terror. Foreign policy has centered on spreading democracy in the non-Western world. This ideology is rooted in democratic peace theory, the theory developed by American sociologist Dean Babst which holds that spreading democracy will result in peaceful international relations (1964). Western thought, which is circulated and advanced in Western universities, is conducive to ideals of representative government and sharing of power, which are core components of democracy. In light of existing literature, the argument of this paper is that Western-educated leaders, despite some constraint by political institutions and competing interests, will have the political power and reform ethic to promote democratization. Testing this argument will involve an examination of Middle Eastern rulers and their attitudes, methods, and practices of government. The proposed research design looks at the dynamics of the relationship between education and democratization within this specific region to see which factors might be inhibiting the connection. My argument is that a Western education will result in a propensity for democratization, although hindering institutional factors can be a roadblock to this process. If an Arab ruler is Western educated, then he will show a greater bent for "democratizability." This concept takes into account a leader's democratic tendencies, as well as his impact on the level of democracy within his domain. This concept is composed of several indicators of democratization and the ways that a leader demonstrates them. This two-part study will include a large-N statistical analysis of leaders' education and democracy scores in a selection of Middle Eastern countries followed by a case study comparing two Middle Eastern rulers, one Western-educated and one not. Operationalizing "democratizability" necessitates the use of an index to indicate how democratic a country is. More specifically, if a leader is Western educated, then the Democracy Index ranking of his country will increase ("Democracy Index" 2012). The discourse of Western-educated leaders will also demonstrate a favor for democratic institutions. Alternatively, if institutional factors such as a strong military or weak governmental establishment precede the ruler's tenure in office, then his democratizability will be obscured. Possible causal mechanisms are that a Western education inherently propagates democratic ideologies to its students, and these ideologies are carried throughout these students' experiences. It could also be argued that living in a Western country during the time of university study exposes leaders to their host country's laws and governance systems, including efficiency of government, balance of power, and civil liberties. Gift and Krcmaric also argue that networks gained from university study will have democratic connections (2013). The question of education and leadership rests on a wide range of factors and underlying causes. This question must be addressed using a large-N study as well as a comparative case study, given the variety of cases within the Middle Eastern region. The independent variable is whether or not a particular leader was Western educated. The cases will be collected using the World Governments and Leaders data set (2013). The dependent variable will be the concept of democratizability as measured by the Economist Intelligence Unit's Democracy Index. This score is expected to be higher in countries ruled by Western-educated leaders. In order to control for external political influence as an obstruction to this correlation, one possible control variable is the receipt of Western reform aid packages. However, foreign economic relationships can take many forms, from aid to investment to economic integration; therefore, this is too complicated to introduce as a single control variable. Another possible control variable is GDP, as wealthier countries have more resources and thus more freedom to democratize. These controls will allow for the assessment of the effect of education on ruling style. There is possible endogeneity in the large-N component of this study, as Gift and Krcmaric point out, as it is likely that countries already on a path of democratization will elect leaders with Western educations, rather than the leaders taking the initiative in this process. However, several cases of power transfer in the Middle East involve nepotism and bureaucracy, rather than legitimate elections, so this endogeneity is unlikely. 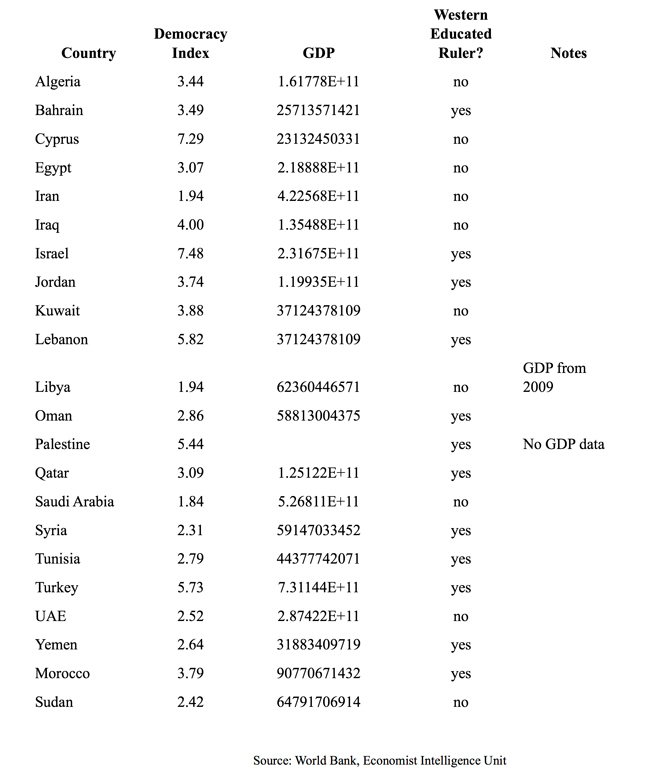 The cases involved in this study will be leaders of the Middle East in the year 2010 (see Table 1). This circumvents the issue of countries in which leadership changed or became ambiguous in tandem with Arab Spring events. Limitations of this case selection are that it is difficult to control for all the institutional and developmental differences between countries in this region. Focusing on one or two cases might eliminate some of this discrepancy; however, this would not allow for as thorough of an analysis of the impact of leadership on the democratizability factors outlined above. While it is hypothesized that a general trend will be observed between Western education and democratization, an argument could be made that the violence of many of the Arab uprisings, rather than the leader's Westernized ideology, may have necessitated democratic reform; an examination of Arab Spring cases addresses this issue. Conversely, if this trend is not observed, it could be argued that institutional factors inhibited democratization. In order to determine the views of Middle Eastern leaders when faced with popular agitation for democracy, an analysis of discourse of these leaders must be included (Anderson 2011). Both Ben Ali and Gaddafi indicated an interest in maintaining power throughout the protests. However, differences can be observed in their discourse on democracy throughout their terms. Ben Ali of Tunisia was educated in France and the US and has demonstrated a more measured response to the Arab Spring uprisings in his country. Gaddafi of Libya, however, had a more traditional Islamic education in Libya and his response to the Arab uprisings was inflammatory. These cases are comparable in that the conditions surrounding the uprisings are relatively consistent. Gaddafi and Ben Ali both held terms of similar length in office prior to the uprisings, the proportion of Muslims in the populations of their countries are the same, and the uprisings occurred during the same time period. The question that this portion will assess is whether Gaddafi serves as a foil to Ben Ali in his spurning of the protestors. It is hypothesized that if a leader is Western educated, as in the example of Ben Ali, then he will be more amenable to democracy-oriented protests than his non-Western educated counterpart, Gaddafi. In this study, the independent variable is again the degree of Western education. However, the dependent variable becomes the degree of support for democracy and adaptability to demands for reform. The discourse of the two leaders on democracy will be assessed at three different points during their rule. Data will include speeches and interviews collected from these leaders during the selected years. This will allow for an analysis of their views and interests, a more micro-level analysis of this causal relationship. A drawback of this case selection is that, despite the fact that these two cases have good consistency, exceptional cases such as Bashar Al-Assad are left out. However, by choosing the cases of Libya and Tunisia, it is possible to examine the effect of a Western education in the most controlled way possible. From there, it can be assessed which obstacles impeded the process of democratization in these exceptional examples. This two-part research will first examine the general trend of the effect of education on Middle Eastern ruling styles, and will then proceed to see how this trend plays out in a comparison of two cases. This allows for irregularities to be taken into account, as well as for the theory to be applied to this region in conformity with existing theories. In this test, the independent variable is the nominal variable of whether a country's leader is Western educated. The dependent variable is the country's Democracy Index, as compiled by the Economist Intelligence Unit. It is expected that if a leader is Western educated, then that country will have a higher Democracy Index. The null hypothesis is that a Western education will have no effect on a country's Democracy Index. Data will be collected from 2010, as irregularities from the Arab Spring could distort the results if taken from a more current year. Additionally, many leaders of interest, such as Gaddafi and Hosni Mubarak, are no longer in power. The initial results indicate that the null hypothesis is correct, and that there is little to no correlation between a leader's education and his or her country's democracy score. The estimation of B0 at 3.234 indicates that the score for most of these countries is low. The B1 value of 0.267 indicates that there is little validity in this correlation. However, because this value is positive, it shows that there is a (weak) positive correlation between a ruler's Western education and democracy. R^2, with a value of 0.071, also indicates that this correlation is weak, given that a ruler's education only accounts for his or her country's democracy index in 7.1% of cases. The p-value of 0.229 indicates that this test is not statistically significant. After introducing GDP as a variable, the results indicate that a leader's education has even less of an influence on the democracy index than when viewed independently. In this regression, the estimation of B0 at 3.139 indicates again that most of the Democracy Index scores for these countries are low on the international ranking. 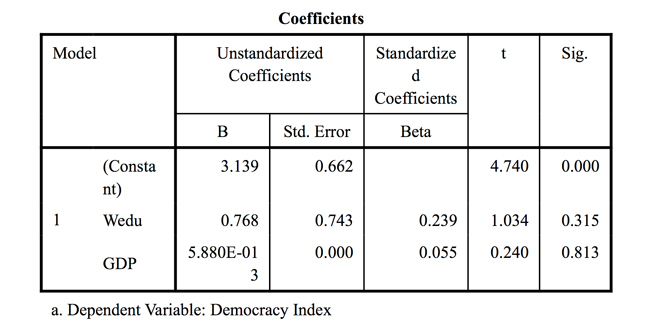 The R^2 shows that GDP and education only account for 5.7% of democracy score cases. The Beta score for a Westerneducated ruler drops to 0.239, and the Beta for GDP is 0.055, demonstrating a very low correlation. The p-value of both of these variables is high, with W.Edu at 0.315 and GDP at 0.813, indicating that these variables are not statistically significant. The inclusion of a few measurements improves the validity of this study. The first involves measuring "democratization" not by the Democracy Index in a given year but by a change in the Democracy Index within a given span of years. This would more accurately reflect the success of each leader in democratizing within their countries. A possible intervening variable could be external aid to these countries by Western countries, as these aid packages may have a positive effect on democratization. However, it is difficult to measure the intent of such aid and its effects on governments' agendas. Additionally, institutional factors such as military presence and the scale of corruption in government would affect democratization. A limitation of the measurement of Western Education is that it could allow for greater variation. The number of years studying abroad and the level of the degree obtained could be influential in a ruler's democratization efforts. However, for many leaders, information is scarce or discrepant on their biographies or the duration and degree of their studies is unknown. Another possible reason for the discrepancy between Gift and Krcmaric's study and this one is that different indices are used, due to availability and coverage of certain countries. Different measurements of this kind may have yielded different results. Finally, the limited number of cases limits the results greatly and may be a reason for the low statistical significance. Including only countries from the Middle East/North Africa region allows for focus on the anomalies found within it, but does not provide a wide enough sample that allows for conclusive results. However, expanding the geographic scope would defeat the purpose of limiting this study to the Middle East. These statistical results disconfirm the hypothesis that a Westerneducated ruler will lead a more democratic country, indicating that the Middle East is an exception to the existing theory that Western-educated non-Western rulers are more likely to democratize. This discrepancy merits a closer analysis, which is what a comparative case study offers. The statistics do not necessarily indicate that Western-educated Arab rulers are averse to democracy. It is possible that even if they hold positive views toward democratization, the challenges associated with democratizing are too great for this process to be realized. The Democracy Index may not be sensitive enough to the efforts of rulers toward democratization, or it may not take into account important historical and structural obstacles to democratization which vary between countries. A discourse analysis of Gaddafi and Ben Ali allows for these rulers' attitudes and actions to be examined more closely. The hypothesis remains that if an Arab ruler is Western-educated, then he will hold a more positive view of democracy and peaceful protest under his domain. It will be determined how these two leaders discuss democratic institutions, elections, and the role of the president, as well as how these perspectives change as their terms of leadership lengthen. Ben Ali, who attended Special Inter-Service School in Coetquidan, France, the Artillery School in Chalons-sur-Marne, France, the Senior Intelligence School in Maryland, and the School for Anti-Aircraft Field Artillery in Texas, has demonstrated a measured approach to democracy since he began his rule in the 1980s. He has maintained positive rhetoric concerning democratic institutions and civilian sovereignty, even in the face of Arab Spring protests. While a change can be detected over time in that he became more protective of his position as president, he still demonstrated respect for the constitution and elections. In 1987, when he began his 24-year presidency, Ben Ali addressed Tunisia in a speech in which he lauded democracy and promised further democratization under his administration. He begins by addressing his "fellow citizens," a term he repeats throughout his speech ("Tunisia: Overthrow of Bourguiba"1987). This epithet appears to be an effort to demonstrate equality and to portray the president as a member of the new country, with a stake in its political and economic success. He repeatedly cites the constitution and outlines his powers and responsibilities as president under it. He describes his desire to govern a country which "guarantees the conditions for a responsible democracy, fully respecting the sovereignty of the people as written into the constitution." All of these statements indicate a strong respect and desire for democracy in Tunisia. While it can be observed that in some respects his policies fell short of guaranteeing economic equality and fully supporting civil society groups, it is evident that Ben Ali's official policy was supportive of democracy (Noueihed and Warren 2012). In 1999, Ben Ali gave another speech following a series of elections in which he reaffirmed his support for the democratic process. However, within this support can be detected an effort to defend his power ("Tunisia: Speech" 1999). In this speech, the president congratulates the new House of Deputies members who were elected and praises the democratic process involved with his own election. He says, "I extend my sincere thanks…to all those who supported me to renew my commitment and continue to assume national responsibility during this term, as President of the Republic and President of all Tunisian and all Tunisians, regardless of their leanings" (1999). This statement appears to be at the same time both a celebration of the democratic process and a preemptive defense against threats to his legitimacy. The end of this phrase, "regardless of their leanings," suggests the presence of a growing opposition that merited Ben Ali's attention. While he does assert his leadership position, the inclusion of this phrase also suggests that the democratic principles for which the president advocates also apply to opposition and minority factions. What is notable in this speech is that the president also advocates for freedom of the press and unbiased media coverage, as well as for positive relations with other countries. This indicates support for transparency and greater freedom. Ben Ali concludes his speech by thanking the National Elections Observatory for ensuring the fairness of elections and the democratic process. Again, Ben Ali appears to use pro-democracy speech as a method of reinforcing the legitimacy of his power. Regardless, he does affirm the importance of democracy in Tunisia. This combination of pro-democracy rhetoric and self-conscious affirmation of the democratic process in Tunisia came to a head in 2011, when Ben Ali made his last speech as president addressing his country in the wake of the Arab Spring ("Tunisia Document" 2011). The president addressed the Tunisian people as "citizens," not "fellow citizens," as he did at the outset of his term. This subtle contrast implies a hierarchy that he deliberately avoided in his early years. He maintains positive language toward Tunisia and democracy, but marginalizes Arab Spring protests as radical "terrorist act[s] that cannot be tolerated" (2011). This extreme language allowed for Ben Ali to maintain control of the unfolding situation in his country while still nominally serving the cause of democracy within Tunisia. Despite these hints of authoritarianism, in his speech the president also addresses the concerns of the protestors using prodemocratic language. He claims, "We continue to be attentive to the concerns of all." He outlines a plan of increasing localized representation, economic and employment opportunity, and education. These plans had clear deadlines and realizable goals, and suggested a positive democratic change that was absent in many other Arab Spring countries. Overall, despite some moments of defensiveness when his power was threatened, Ben Ali maintained positive discourse and efforts regarding democratization. It is significant that in his speech he promises to address the grievances of the protestors, appealing to their interests on official terms. This long-term positivity regarding democratization is indicative of Ben Ali's Western education. One might question to what degree the discourse of Ben Ali was reflective of actual democratic change under his rule. However, it can be seen that this pro-Western democracy perspective is largely missing from the discourse of Gaddafi, who was educated in various schools throughout Libya, and the Democracy Index score for Tunisia in 2010 was 0.85 greater than that of Libya. Given that these two countries were comparable cases in other respects, this supports the hypothesis that Ben Ali's Western education gave him a more democratic bent to his ruling style. Gaddafi's stance toward democracy is better assessed through a mix of discourse. His 1975 Green Book outlines his formula for a direct democracy which disavows parties and parliaments in favor of people's congresses. His discourse is consistently suspicious and inflammatory against contemporary democracy. Throughout his term, he clings to this stance in interviews and speeches, claiming that Libya has a perfect system of government and that all other forms of democracy are false. A 2003 interview with Columbia University and a 2011 speech in response to Arab Spring protests confirm this tendency. Gaddafi's Green Book addresses the selected topics of elections, democratic institutions, and the role of the president (1975). He claims to be the forbearer of true democracy (direct democracy), yet his perspective on contemporary democratic institutions is extremely negative. He claims, "It has become the right of the people… to destroy… the so-called parliamentary assemblies which usurp democracy and sovereignty" (Qaddafi 1975). He advocates instead for localized people's councils in which to resolve policy issues. This suggests a shallow understanding of the operationalization of democracy in practice. One of the chapters concludes, "The deception, falseness, and invalidity of the political theories dominant in the world today [are] obvious. From these emerge contemporary conventions of democracy" (Qaddafi 1975). Gaddafi repeatedly refers to his Bedouin roots and his rich experience in Libyan politics and society. This is suggestive of this paper's argument that leaders who are not educated in Western democracies are not exposed to the ways in which these government systems operate in society, and thus pursue alternative methods of government. Gaddafi sticks to this rhetoric throughout the following decades. In a 2003 Skype interview with Columbia University, he again decries the "travesty of democracy," namely, the system of voting for representatives (2003). He claims that party systems are known for their "falsification," and that "the government system is hated." This appears to be an attempt to marginalize opposition within Libya that may be campaigning for greater representation in government. This trend continues when Gaddafi is asked about the highly restrictive freedom of the press in Libya. He states, "If one criticizes the system, they are criticizing themselves." He claims that because of the presence of local people's councils where debate and discussion can occur, there is no need for the press to cover opinions which run contrary to the government, explaining the logic that, because it is illegal to be insulting to a person in written material and the government truly represents the people, criticizing the government is against the law. The logical flaws in this argument have problematic consequences for Libyan citizens. When asked about human rights in Libya, given that this country is a signatory of the International Convention on Human Rights, Gaddafi referred to the right to self-determination and the right to labor as the two basic human rights, and then followed to say that Western democracies violate these rights with their systems of government while Libya does not. Interestingly, Gaddafi admitted that his country was plagued by "social backwardness." He cited colonialism as the cause of this deficiency and Western education as a possible remedy. It appears that a source of his animosity toward Western systems of government stems from viewing the disastrous effects of colonialism, yet he acknowledges the quality of Western education systems. As for his response to the Arab Spring uprisings within his country, Gaddafi used the same language of glorifying direct democracy and vilifying dissent in a televised speech from Green Square on July 1, 2011 ("Gaddafi Speech" 2011). He addresses NATO and many of the European countries who placed economic sanctions on Libya by speaking at a pro-Gaddafi rally using prideful and nationalistic language glorifying his country. He portrays the Arab Spring as an external threat, exclaiming, "You provoked the Libyan people by bringing them traitors and suggesting that they are the Libyan people! Is that your democracy?" (2011). He claims that "the Libyan people can change the system whenever they want" in an effort to illustrate that there are no problems with the government in Libya, before proceeding to marginalize the protestors as traitors who operated outside the realm of what was necessary in order to undermine the government. He refers to the protestors as "traitors and mercenaries who are killing your children daily" ("Gaddafi Speech" 2011). His assertion is that because Western democracies do not understand the perfect system that is Libyan direct democracy, they are hostile to it and try to disrupt it by drawing attention to the "traitorous" protestors. Gaddafi states that the solution is in the hands of NATO and other Western powers, as they are the source of the problem. By framing the Arab Spring protests as an external threat, Gaddafi draws upon colonial resentment and anti-Americanism to rally support and squash dissent. This further illustrates Gaddafi's disregard for freedom of expression and democratic institutions. By hiding behind his "perfect democracy" he avoids engaging in real democratic reform. Neither Ben Ali nor Gaddafi are examples of perfect democratizers in the Middle East. However, given the comparability of their cases, Ben Ali demonstrates a much greater bent for democratizability in his perspectives toward democratic institutions and freedoms. Both leaders engaged in democratic discourse but they differed in their methods of endorsing their government style and reacting to democratic-oriented protests. While Ben Ali praised elections and parliaments and allowed for the demands of his citizens to be heard, Gaddafi vehemently clung to his notion of government and refused to acknowledge the legitimate demands of opposition in his country. These trends support the hypothesis that a Western education results in greater democratizability. The causal mechanisms that were revealed through this discourse are that through exposure to a variety of Western education and political systems Ben Ali was able to see democracy in action both in Europe and in different parts of the United States. This gave him a more positive view of democracy and how it operates in different countries, allowing him to more effectively implement aspects of democracy in Tunisia. Gaddafi, by contrast, associated Europe with colonialism and the United States with its imperialism in the Middle East. Because he was not exposed to the positive aspects of Western political systems, he attempted to forge his own way, defining his own system of government and labeling those who did not follow suit as puppets of the United States and Europe. Looking at this issue statistically and qualitatively yields different results, but not results that contradict each other. The large-N study of Middle Eastern rulers and their education and democracy scores revealed no correlation between the two. This suggests that the Middle East is an exception to the existing theory that Western-educated leaders tend to democratize. However, it is likely that the reason for this lack of correlation is that the Democracy Index does not take into account different political, economic, and social structures of the countries it measures. Using the starkness of statistics to measure something as dynamic and complicated as democratization within a country is problematic. Democracy is not a static concept, nor is it a universally applicable set of criteria. A more nuanced method for assessing democratizability is through qualitative methods. This brings us back to the question of an individual leader's ability to affect political change, particularly in the Middle East. It appears that there is a definite transition of ideology from education to personal beliefs, but democratic ideals do not translate as smoothly from personal belief to real democratic change. Differences in leadership and government tradition, as well as the state of war or conflict, have dramatic effects on democratization within a country. Therefore, it is necessary to examine two similar cases to see how this proposed correlation plays out on a more micro level. Looking at these two cases not only supported the hypothesis, but also brought up the underlying themes of colonialism and anti-Americanism. The role of discourse in the Arab Spring, as well as throughout these two politicians' careers, is significant, as it sets the tone for their leadership style and future prospects of democratization. Gaddafi's references to colonialism as a source of mistrust between Libya and many Western countries contrasts sharply with Ben Ali's welcoming of good relations with Western countries based on political freedoms. It appears that, despite the deeply negative effects of colonialism on development and relations between Africa and Europe, a Western education can lessen the impact of these hostilities. Ben Ali, likely due to his exposure to a variety of Western societies and government systems, was able to integrate Western democracy practices into his country's political and societal structure. However, Gaddafi, who decries modern democracy as rigid and false, remained steadfast in his commitment to his own ruling style and viewed any challenge to this system as a threat from the West. He even ridiculed leaders of countries who had good relations with European countries or the US. This suggests a competitive hostility toward democratic politics. Overcoming these rivalries is a daunting task, but part of this effort could include increased exposure to democratic systems through education. While a Western education does not guarantee democratic progress, as can be seen in the large-N study, it does appear to foster reform and democratization efforts within a country when looked at more closely. Another issue, as discussed by Eva Bellin, which arose in this comparison, is the degree to which these presidents were motivated by religion. Islam is seen by many critics as an impediment to democracy, and though this is likely untrue and was therefore not a variable examined in this comparison, it is significant to note that Gaddafi demonstrated much more of a connection to his Bedouin and Islamic heritage than did Ben Ali. This may contribute to the rivalry observed between Gaddafi and Western democracies. The issue of secularism versus Islamism is one prominent in the Middle East which likely comes into play in this trend. Leaders such as Ben Ali who are educated in Western democracies are more likely to be exposed to secular, efficient governments, which they are likely to then export. While Tunisia is not a secular country, the intense religious proclamations which permeate Gaddafi's speeches are missing in Ben Ali's. The implications of this research are that democratic attitudes, if not complete democratic change, can be fostered in the Middle East through educating rulers in Western countries. Ultimately, a Western education alone is not the sole determinant of democracy, yet exposure of a leader to efficiency of government can prompt the institutional reform that is needed in transitioning countries such as Libya and Tunisia. This is a positive prospect for Western democracies because, according to Democratic Peace Theory, shared democracy lessens conflict and warfare between states. If democracy can be spread throughout the Middle East through a method as simple as education exchange, then there is an incentive for Western universities to open up to non-Western students, preparing a new generation of politicians to have views conducive to democracy and positive relations with the countries of their education. At the diplomatic level, these cultural and educational exchanges should be encouraged as well. A key component of the Western education hypothesis is the cultural exchange that occurs during university education. As diplomatic lines stay open, this encourages overseas education, which in turn reinforces positive relations and democratization. Possible further areas of research on this topic would involve investigating notable exceptions such as Bashar al-Assad or Hosni Mubarak, who were Western-educated but have strongly anti-democratic track records. Additionally, the application of this trend in law and policy could be examined, as well as the implications for peace keeping and the foreign relations of Middle Eastern countries. It could also be determined whether Western scholars teaching in non-Western countries have an effect on democratic attitudes in those countries. Public receptiveness to democratization under these circumstances is another important factor to be studied. Gift and Krcmaric took the first steps in establishing this broader trend of Western-educated leaders democratizing more than their non-Western educated counterparts; however, there are many dynamics and implications of this trend that can be studied further. The relationship between a Western-educated ruler and democratizability is one that is complicated, yet has many important implications for security, foreign policy, and human rights. Understanding the ways in which this pattern plays out involves examining the individual as well as state levels of analysis, and regional idiosyncrasies must be taken into account. For the Middle East, these idiosyncrasies are a combination of religion, post-colonialism, and increased global attention in the wake of the War on Terror and the Arab Spring. However, it can still be observed that a Western education could play a key role in the process of democratization in this region. Anderson, Lisa. "Demystifying the Arab Spring." Foreign Affairs 90, no. 3: 2-7. 2011. Accessed October 25, 2013. Babst, Dean. "Elective Governments: A Force for Peace." The Wisconsin Sociologist. 1964. Accessed 29 September 2013. Bellin, Eva. "The Robustness of Authoritarianism in the Middle East: Exceptionalism in Comparative Perspective." Comparative Politics: 36: 2, 2004. Accessed 29 September 2013. Bueno de Mesquita, Bruce. "Political Institutions, Policy Choice, and the Survival of Leaders." Hoover Institution and New York University. 2002. Byman, Daniel. "Latter Day Sultans." The National Interest. 108, 2010. Accessed 29 September 2013. Cornell, Agnes. "Does Regime Type Matter for the Impact of Democracy Aid on Democracy?" Democratization: 20: 4, 2012. Accessed 29 September 2013. "Compare World Governments." World Governments and Leaders Reference. Find the Data, 2013. Accessed 25 October 2013. "Democracy Index 2012: Democracy at a Standstill." Economist Intelligence Unit. The Economist. 2012. Accessed 5 December 2013. Dewan, Torun and David P. Myatt. "On the Rhetorical Strategies of Leaders: Speaking Clearly, Standing Back, and Stepping Down." Journal of Theoretical Politics: 24:431, 2012. Accessed 29 September 2013. "Gaddafi Speech 1.7.2011." Found in "Muammar Gaddafi, Green Square, Tripoli, 2011." Libya 360 Archive. Accessed 8 December 2013. "Gadhafi Streaming Dialogue at Columbia U." Columbia University. Found in Soviet.ie, "Colonel Al Gaddafi Explains Direct Democracy to Columbia University." 17 August 2012. Accessed 8 December 2013. Gandhi, Jennifer and Adam Przeworski. "Authoritarian Institutions and the Survival of Autocrats." Comparative Political Studies: 40: 1279, 2007. Accessed 29 September 2013. Gift, Thomas and Michael Krcmaric. "Who Democratizes? Western Educated Leaders and Regime Transitions." Duke University, 2013. Accessed 29 September 2013. Jervis, Robert. "Do Leaders Matter and How Would We Know?" Security Studies: 22:153–179, 2013. Accessed 29 September 2013. Jhee, Byong Kuen. "Economic Origins of Electoral Support for Authoritarian Successors: A CrossNational Analysis of Economic Voting in New Democracies. Comparative Political Studies: 41: 362, 2008. Accessed 29 September 2013. Locke, John. The Second Treatis of Government. Dover Publications. New York: 2002. Louër, Laurence. "Changez ou Vous Serez Changes." Politique étrangère 4/2005. Accessed 29 September 2013. Matic, Davorka and Mirko Bilandzic. "Political Islam and the Prospects of Democracy in the Arab World: the Case of Egypt." Polemos: 13: 26, 2010. Accessed 29 September 2013. Montesquieu, Baron de. The Spirit of the Laws. In The Complete Works of Baron de Montesquieu. London: 1777. Vol. 1. Noueihed, Lin and Alex Warren. The Battle for the Arab Spring: Revolution, Counter-Revolution, and the Making of a New Era. Yale University Press: New Haven and London, 2012. Al Qaddafi, Muammar. The Green Book. Revolutionary Committees Movement. 1975. Accessed via Zadishe Freeman on 8 December 2013. Rousseau, John Jacques. Social Contract and Discourses. New York: 1913. "Tunisia Document: President Ben Ali's Speech ‘Hostile Elements in the Pay of Foreigners.'" EA Worldview. 10 January 2011. Accessed 5 December 2013. "Tunisia: Overthrow of Bourguiba." Al Bab. 7 November 1987. Accessed 5 December 2013. "Tunisia: Speech by President Ben Ali." Al Bab. 26 October 1999. Accessed 5 December 2013.